Let’s close with a serious point. Yes, business owners are greedy. They’re looking out for their own self interest. They would love to charge us high prices. You are right that a market economy does not exist separate from govt, but you seem to exaggerate the point too much. Yes, govt needs to supply necessary structure like rule of law, property rights, and a stable currency. But let’s also be clear about the rest of the story. It is capitalism and freedom from overbearing govt and a good culture that creates prosperity. Govt does not create prosperity. Government is necessary for prosperity, but not sufficient. It’s also a much smaller factor. So fine, give govt 10% of the credit because they provide necessary structure. But economic freedom and a commerce-respecting culture deserve the lion’s share of the credit. A market economy does not exist separate from government – it is very much a product of government rules and regulations. Capitalism thrived in the United States because government provided the infrastructure, clean water, ubiquitous electricity, disease control, a body of law, and many other things that business needs to thrive. Our “free” market system is that it would simply not exist as we know it without the presence of an active government that creates and maintains the rules and conditions that allow it to operate efficiently. Don’t be so inexact about GPS. The US military developed the first GPS for battlefield support. The interstate road system was promoted and funded for military reasons. The military funded and bought the first computers and semiconductors. So, by your reasoning, we should dramatically increase funding for military researach if we are all to have a better life. I suspect that the military has done some of everying in early stages, and so could be credited with starting everything, by tortured reasoning. I think that the good things would have been done anyway and better, if the government were not in the way restricting private development and treating everything as a secret. An errant thought. Possibly all of this development is really a private, market result, with canny private interests getting the government to invest the resources for early development and then taking over the results. Thus, private developers don’t have to invest in many failed government projects. Solindra comes to mind. Marcgarret1,,,,,, if you check I think you’ll find a lot of those satellites bouncing around overhead are privately owned…. The first image is funny and expresses a fundamental truth. But the second image is misleading and deserves to be called out. Two examples: the iPhone would not do what it does were it not for GPS, which was funded by the government. Likewise, that shiny laptop in Steve Jobs’ hands would not be so useful had the government not funded ARPANet. I lean libertarian but there’s a role for government to support the private sector and your second image proves it. A bit too extreme. Agree that large corporations can tend toward bad customer service, but it’s not absolute. Like anything else, corporations can be good, bad, or average. Good ones provide good customer service. Large companies can provide widespread incentives for good customer service, and they can create a culture that makes it the norm. 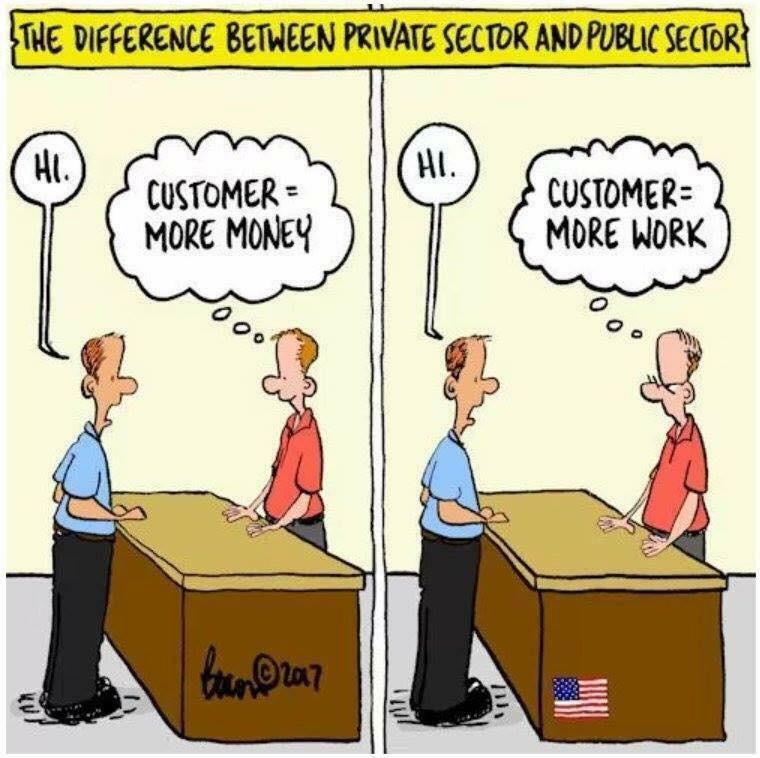 Employees at large corporations behave exactly like government employees: a customer equals more work. These employees don’t get any added benefits when they go above and beyond!